What Are the Risks of Chronic Brain Damage For Retired Athletes? The answer, surprisingly, may be scientifically uncertain. That said, some common sense observations can be used to bridge this scientific gap to conclude that there are real risks associated with long term participation in contact sport. 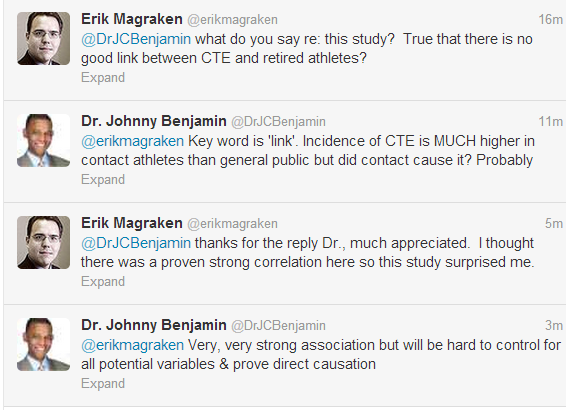 While more studies are clearly needed to more thoroughly explore the risks of CTE from contact sports, Dr. Benjamin’s common sense observations can help athletes appreciate that real risks nonetheless exist which can help lead to more informed participant consent. Does the MFC’s Ban on WMMA Violate Human Rights Legislation?